Phillip Meacham creating “Projecting Emotions.” Photo courtesy of Phillip Meacham. 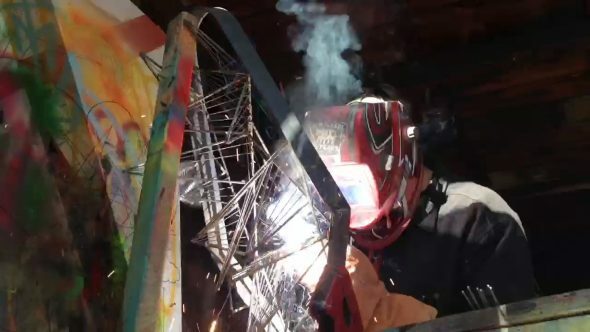 BoldPas: An Art Takeover of Old Pasadena is a free, one-day art event that showcases 13 temporary art installations throughout the historic alleyways of Old Pasadena from noon to 8 p.m. There will also be three live painters, 25+ merchant art stops, and art activities for all ages. To get to BoldPas, take the Metro Gold Line to Del Mar or Memorial Park Station. From there, all art installations are just a short walk away! 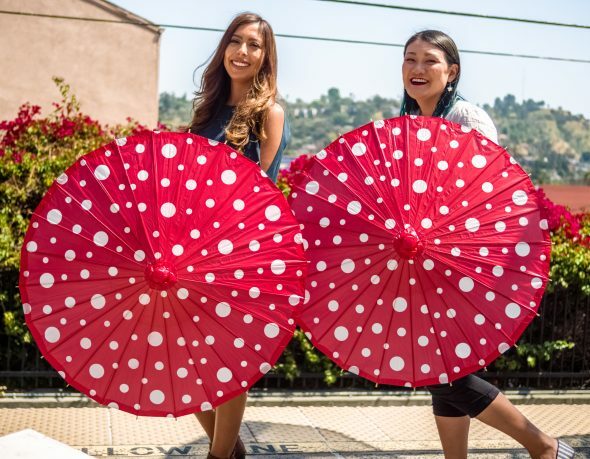 Show your TAP card at any of the three info booths during the event and receive a free polka dot parasol while supplies last. Numbers are limited so definitely arrive early if you want to snag one. Show your TAP cards at info tables to receive a free paper parasol while supplies last. You can also cruise around Old Pasadena on Metro Bike Share to visit the various art stops, museums and more. We were able to visit two of the artists participating in BoldPas to get a preview of what to expect. Kelley Anderson will be installing “Moss Wall” – the lush, vibrant live moss will serve as the backdrop for a collective wishing tree, inspired by the Japanese tradition of Tanzaku. “Moss Wall” will be located at Mercantile Place, about two and a half blocks south from Memorial Park Station via Raymond Avenue. Artist Kelley Anderson working on her moss wall. Keith Patterson and Viviana Palacio will be installing “A Puzzle for Pasadena” – a large-scale puzzle with unique patterns that event-goers can help solve to reveal the history behind the origin of Pasadena’s name. Check out “A Puzzle for Pasadena” at Big Bang Theory Way, which begins across the street from Memorial Park Station. Which Pasadena station was the parasol picture taken at? This was taken at Southwest Museum Station for promotional purposes.